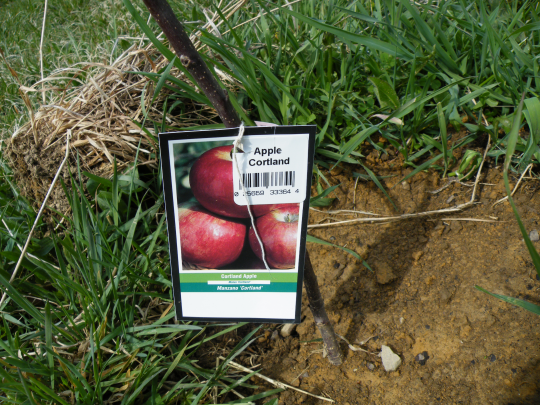 The weekend started off easily enough, with plans to make a map of my small orchard. I walked around and took pictures of each identifing tag, and added each varieties name to a map. I’ve used a small piece of wood for my map, and a pencil to write on it. The scrap wood will be hung up in the greenhouse, and hopefully, It will be readable long after the tags on the trees blow away. This happened to the row of trees in front of my house, and so, I can’t identify which types of fruit they are. I plan to graft trees in the next few years, so it’s important to document which variety each tree is. After finishing the map, I went inside the house to take a look at my second batch of chicks. To my suprise, 7 of the eggs had cracks, and the chicks were already chirping to encourage each other to break free. 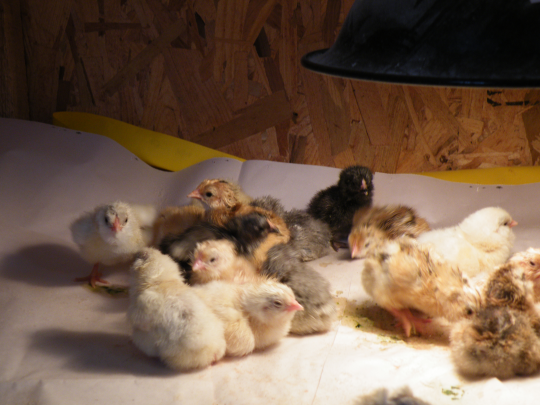 The chicks would soon need to be moved out of the incubator, and I wasn’t prepared. I thought I had two more days to build the larger chicks a new home, I was wrong. So now I had my work cut out for me. Luckily Sandy, Davie, Nate and Kareese were available to help. 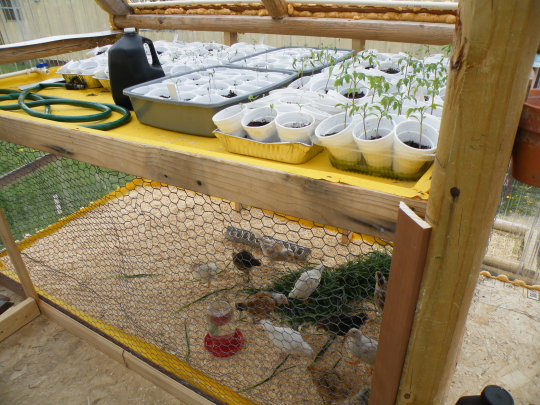 We got started working in the greenhouse to build a new home for the first batch of chicks. One of the few places I had room for the chicks was under one of my water tables. As you can see above, this arrangement works pretty well for now. I plan on building a chicken house soon, but this will work for the time being. With the larger chics out of the house, the chick pen had to be cleaned out, and it was; just in time for the first 8 chicks. Here is my second batch of chicks. I was quite happy with this batch as the chicks are all different colors. I even have two gray chicks. Before that day, I had never heard of a gray chicken, and too have two of them was neat. Now my work for the weekend was complete. I decided to walk around and take stock of the plants I’ve been diggin holes for. The elderberries I transplanted from Sandy & Davies farm are doing pretty good; the Rose-Hips not so well, but I still think the roots will make a pretty decent come back; The cherry bushes are doing great, as if they were never disturbed. I still need to plant rows of interesting new plants I’ve ordered. They are Saskatoon Blueberries (Juneberries), Sea-Buckthorn, and Pixwell Gooseberries. Here are the onions, complete with rows of weeds in between. You’ll find I’m not much of a garden weeder. My take on weeds is, if they are six inches away from garden plants, then they don’t need to be ripped out. There’s no point in it. 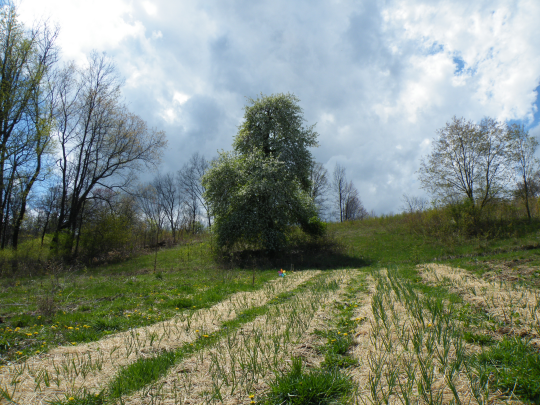 I should point out: If you don’t cover your onions with hay, or straw, their will be many, many more weeds, I learned that last year =).